Sara Baras is a living legend in Spain, a diminutive dancer with an unparalleled skill and passion for flamenco. This documentary takes us inside the preparations for her most recent creative work “Voces”; a tribute to the history of flamenco and the great artists who have preceded and inspired her. During the world tour of her show through Spain, France, Mexico and the United States, we get to know Sara Baras, as her art, her personality and her values contrast with these very diverse societies. 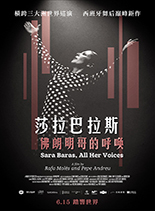 We also discover, beyond Sara’s relationship with the traditions of flamenco, that in our everyday lives we must all choose whether we accept the established world or if we decide to change it.